The year 2016 began a new era of political populism throughout the developed world. In the United States, the face of that populism is President Donald Trump. Despite being called every name in the book, and despite over a year of bad predictions, Trump managed to win the White House. Rather than seriously wonder why the New York billionaire with tons of skeletons in his closet managed to win over blue-collar workers, Christian conservatives, and more Latino and black voters than the previous Republican nominee, the American media has doubled and tripled down on calling President Trump a white supremacist, a homophobe, an Islamophobe, etc. Tucker Carlson, the popular Fox News host, has a dire warning for those unwilling to learn the lessons of 2016: start listening to the American public or face the prospect of a violent revolution. In Ship of Fools, Carlson highlights the fact that America has dissolved into an oligarchy that only pretends to practice democracy. This cannot sustain itself, especially when identity politics continue to tear at the delicate balance of America’s race and class issues. Many liberal and left-of-center people will refuse to pick up this book. After all, Carlson is a full-throated conservative who has never hidden his right-wing views. 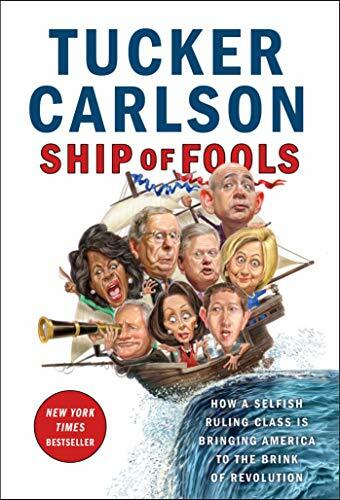 That being said, in Ship of Fools, Carlson often sounds very left-wing. For Carlson, the new secular religion of multiculturalism and open borders are just a dodge to keep Americans from recognizing that the middle class has been so thoroughly gutted that native-born workers are either working for less wages than their parents or are dying off in droves due to drugs, suicide, and general despair. Carlson also attacks professional environmentalists for harping about climate change (which Carlson sees as an open-ended problem, thus making it a perennial cash cow) when cities like San Francisco and Los Angeles have become sanitation disasters. Environmentalists are not even concerned about littering anymore, Carlson notes. Overall, Ships of Fools is a targeted snipe at the Democrats and Republicans and their elite enablers. Carlson despises the fact that, until the rise of Donald Trump, both parties agreed with each other. Both support the endless deployment of U.S. troops abroad and both support globalized financial capitalism that has utterly destroyed the Midwest and America’s manufacturing base. Even worse, the collusion between Democrats and Republicans has bred a type of arrogant elitist who is insulated from all mistakes. Characteristic of this new elite class are people like Max Boot, the war hawk who constantly eggs on American invasions; William Kristol, the self-proclaimed guardian of the Republican Party who will never refuse his guilt for the Iraq War debacle; Maxine Waters, the notoriously corrupt race baiter who lives in a posh all-white neighborhood; Mark Zuckerberg, a child of privilege who uses the power of his monopoly to suppress the opinions of the American majority. Ship of Fools is a broadside full of rage. Carlson’s targets are our mindless elite, most of whom are sheltered in the time-warp known as Washington, D.C. At its heart, this book has a very dire warning: the current path of self-destruction in American life can only end in two ways: 1) the suspension of democracy and the installation of authoritarian rule, or 2) the gutting of the elite and a return to the practice of mass democracy. Carlson would prefer the latter, but Ship of Fools points out with great relish that, in America, our elite seem hell-bent on not listening to voters at all. Benjamin Welton is a fiction author and freelance journalist whose numerous articles have appeared in such venues as The Atlantic, The Weekly Standard, VICE, Metal Injection, Listverse, and The Smart Set. He has also been a military policeman.